AirPura G600DLX is the AirPura G600 air purifier upgraded with AirPura G600DLX oversize canister to ensure a superior level of chemical adsorption while being the most chemically inert Airpura air purifier. 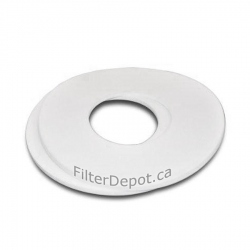 AirPura G600DLX achieves this goal by capitalizing on the AirPura chemically inert design with addition of the AirPura G600DLX massive amount of German Odorless Carbon and the AirPura unbleached pesticide-free odorless cotton pre-filter. 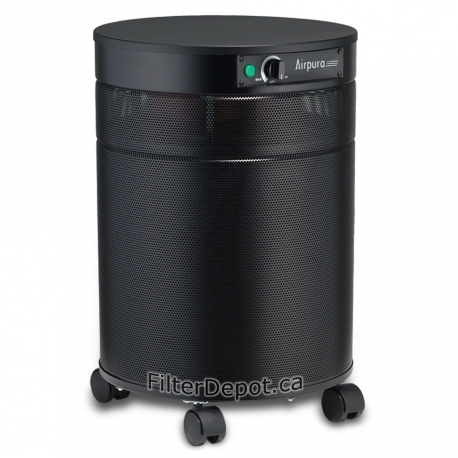 AirPura G600DLX employs a massive (26 lbs) amount of German Odorless Carbon in AirPura oversize filter canister. AirPura G600DLX uses AirPura odorless unbleached Pesticide-free Cotton pre-filter. AirPura G600DLX is powered by the energy efficient and quiet one-piece motor/fan unit. The AirPura G600DLX variable speed control offers a flexibility of selecting the optimal air flow in all conditions. AirPura G600DLX delivers a superior air flow of 560 CFM and can clean effectively large areas up to 2000 sq. ft.
AirPura G600DLX features non off-gassing the all metal housing with a durable appliance quality thermoset powder coating. AirPura G600DLX carries a comprehensive 5-Year Part / 10-Year Labor limited manufacturer's warranty. AirPura G600DLX doesn't produce any ozone or toxic off-gassing and is totally chemically inert. AirPura G600DLX ships Free by Ground service in the continental USA and in Canada. There are No US Tax and No Border Crossing fees on AirPura G600DLX purchases. AirPura G600DLX comes with a 30-Day Money Back Satisfaction guarantee Return policy. AirPura G600DLX - When to Use? AirPura G600DLX Air Purifier is an indispensable air purifier when it comes to creating and maintaining the Chemical-Free environment to bring Relief to individuals with Hyper Chemical or Multiple Chemical Sensitivity in large home, office or institutional areas up to 2000 sq. ft. 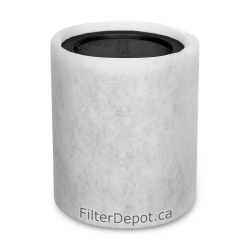 Oversize 3-inch deep carbon filter canister with Odorless German Carbon. 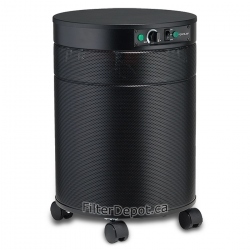 The core of the AirPura G600DLX air filtration system is the oversize carbon filter canister. It contains a massive amount (26 lbs.) of Kosher and Halal Certified German Odorless Carbon adsorbent. This G600DLX exclusive Carbon is totally chemically inert and therefore safe for use in air purifiers for individuals with Multiple Chemical Sensitivity symptoms. The huge amount of adsorbent along with the extended dwelling time in 3-inch deep carbon bed ensures a superior level of chemical adsorption. 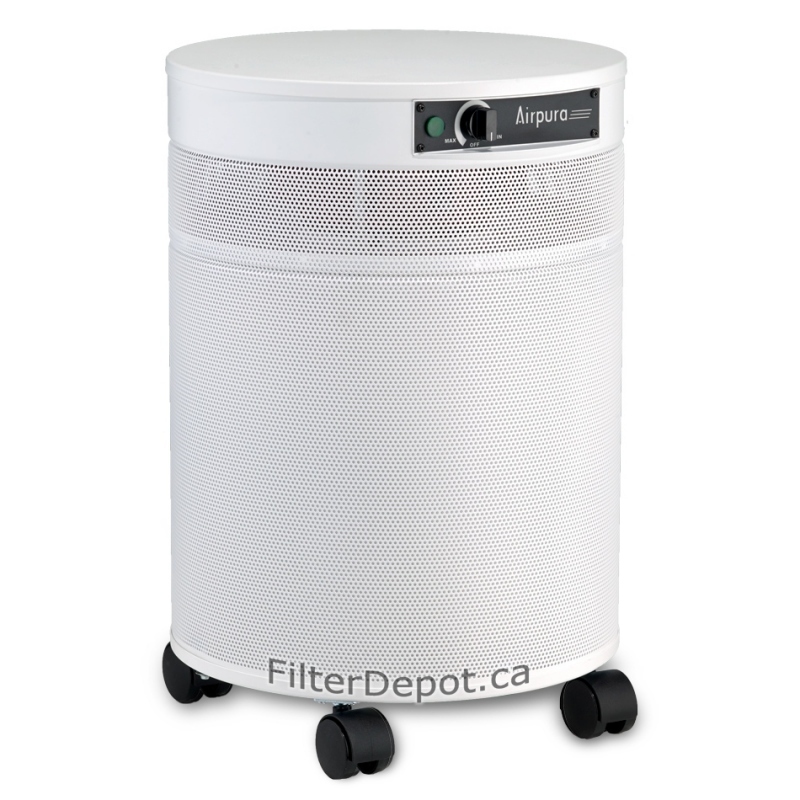 The AirPura G600DLX HEPA-Barrier post filter is standard in all AirPura models with oversize carbon filter canister and delivers an adequate filtration of the air from most common allergens and dust. To achieve the status of being as much Chemically inert as possible, the AirPura G600DLX employs the Airpura unbleached Pesticide-free cotton pre-filter as a standard component of the air filtration system. It traps most of larger dust and dirt particles, while providing protection to the G600DLX air filtration system from faster contamination. AirPura G600DLX is equipped with the same powerful, yet energy efficient backward impeller Motor/Fan assembly with variable speed control rated at 560 CFM. As a part of the AirPura initial chemically inert concept design, the motor, wiring and electric components are isolated in the separate chamber to prevent the already purified air getting in contact with these components and avoid possible re-contamination. The variable speed control offers the AirPura G600DLX users a convenience of selecting the speed setting that is the most suitable for any particular application, activity or a time of the day. The AirPura G600DLX can be equipped with optional Motor and Power cord for 220-240 Volts, 50 Hz power supply per customer's specification at Extra cost. 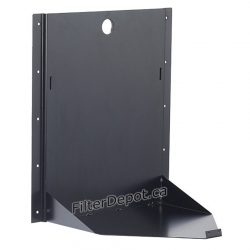 AirPura G600DLX features the AirPura unified non off-gassing the all metal durable, impact resistant housing. 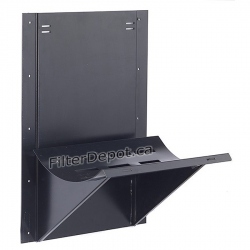 The 360° Polluted air intake (lower deck of the unit) and 360° Clean air outlet at the upper deck of the unit improves the overall air purifier performance and helps reduce noise. The Four Wheel Casters on the G600DLX bottom panel ensure an easy mobility of the air purifier within the cleaning area. The non off-gassing nylon wheel casters contribute into the overall chemically inert design of the AirPura G600DLX. AirPura G600DLX air purifier carries the most comprehensive limited manufacturer's warranty.